With FC Ingolstadt 04 recently guaranteeing their top-flight survival, TSG 1899 Hoffenheim will look to take another step toward the same when the teams meet at the WIRSOL Rhein-Neckar Arena on Saturday (kick-off 15:30CEST/13:30GMT). It has been a turbulent season for Hoffenheim, who occupied an automatic relegation place uninterrupted between Matchdays 9 and 26. The Sinsheim club lost 3-1 to Borussia Mönchengladbach last Sunday, but having taken 13 points from their five preceding games, the great escape remains on for the Bundesliga's youngest ever coach, Julian Nagelsmann. A win could see Hoffenheim open up a seven-point gap on the automatic relegation places with six points left to play for, depending on Eintracht Frankfurt's result at SV Darmstadt 98. Ingolstadt guaranteed Bundesliga survival last Saturday, pulling up to 40 points after a 2-2 draw against Hannover 96. Now five points away from FC Schalke 04 in seventh, European qualification remains a mathematical possibility for Die Schanzer, who are likely to be without injured defenders Marvin Matip and Romain Bregerie. 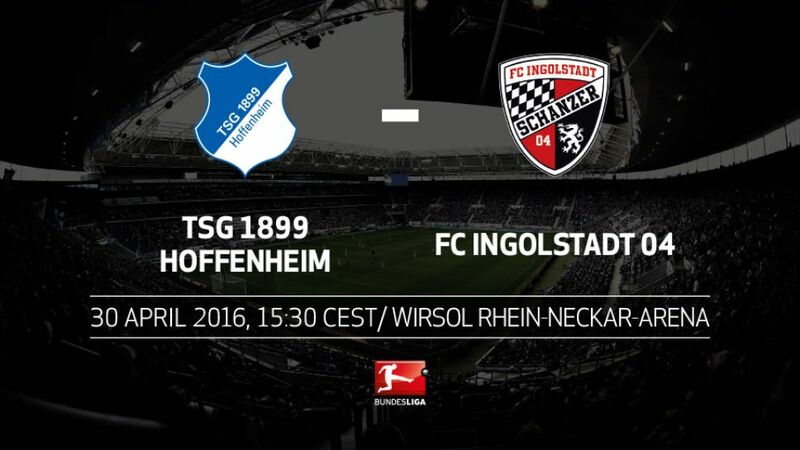 This is the first of two remaining home games for Hoffenheim. The Sinsheim club are undefeated at home under Nagelsmann.Moritz Hartmann's goal against Hannover brought him onto ten for the season. In his seventh season at Ingolstadt, the forward has not reached double figures for the club since scoring 21 in the 3. Liga in the 2009/10 campaign.Hoffenheim have never lost a competitive match against Ingolstadt.Nagelsmann's troops have only conceded one goal in their previous four matches.Ingolstadt's Ramazan Özcan and Pascal Groß helped Hoffenheim to promotion to the Bundesliga at the end of the 2007/08 season.